Flights search engine Skyscanner recently launched a redesigned version of its site in beta, with the aim of making it smoother and more usable. There are plenty of travel search engines around, so how does the new Skyscanner measure up? The Skyscanner homepage is nice and neat, with plenty of white space and not too much clutter. 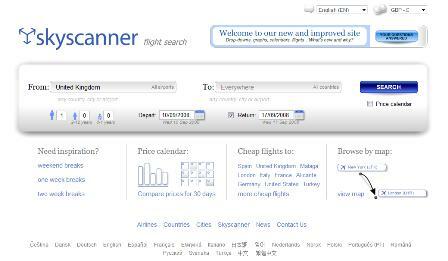 The search box dominates the page, which makes it clear what users need to do to find a flight. As well as the main search box, other options for finding flights include searching through weekend breaks, two week breaks etc, using a map, or using the calendar for available flights. Skyscanner has made the search function pretty usable, starting with basic information on number of passengers, travel dates, departure airport and destination. The site has replaced its previous drop down menus showing airports and cities with a feature that suggests destinations as you type. This is useful in avoiding spelling errors which would return no results. This is potentially useful but, once you have chosen flights from the calendar and clicked on ‘next’ your flights are deselected on the next page, meaning you have to choose all over again. Also, the same flights and prices were often unavailable or difficult to find when this happened, which could be a source of frustration for customers. Skyscanner has also provided a map so you can select the airport for departure, then the destination. This is a nice idea, and it certainly looks good, but it is a little confusing to use, and takes much more time than it would to type in the ’to’ and ’from’ airports in the main search box. It could be more usable too. The map starts out zoomed in on the UK and parts of Northern Europe. Once you have selected your departure airport, an arrow appears for you to point to your chosen destination. Unfortunately, the boundaries of the map don’t move when you reach the edge with your cursor, meaning that you have to use the arrows or zoom tool to move around the map, which is not the best way to do it. Most users will be better served by the main search box. The search results are easy to understand, and can easily be adjusted to show dates and times other than those originally searched for. One problem is that not all prices are displayed, and some of the prices displayed may be a day or so out of date, so users need to select ‘check now’ next to individual flights to see an up to date price. Surely it would be better for Skyscanner to automatically search for the latest prices to save the customer having to so themselves, as this can be time consuming when looking through a range of flight times. It may also reduce a user’s trust in the accuracy of the search results. This may not be wholly in Skyscanner’s hands, as many such sites rely on daily feeds provided by travel agents and tour operators which aren’t always up to date by the time the customer searches for a flight. As well as altering dates, users can filter their results by depart and return time slots, the chosen airlines, and the number of stops and changeovers, which is all good. It would be good to be able to limit the searches according to budget though, which would avoid the need for customers to hunt through flights which are out of their price range. Results can be displayed in order, showing cheapest first, but this option is only via an unlabelled button on the filter options which I only discovered by accident. 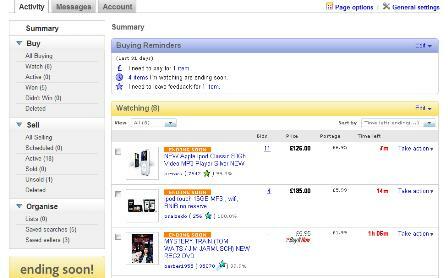 Ideally, customers should be able to set a maximum price. This is a useful summary, but users should be aware that extras such as in-flight meals will cost extra once they choose to book the flight. Mandatory taxes are included in the prices quoted though. Also, leave it to long to select ‘book with airline’ and the price may no longer be available. Once you select to book the flights, you are transferred to the travel operator, so the checkout process depends on the airline you have chosen. I think Skyscanner would also benefit from making the ‘book flight’ button stand out more. It is in the same blue as other features on the page, as well as being hidden away below the fold. Skyscanner is an attractive site, and is pretty easy to use. The main search function works well, and provided a good range of results and prices from different airlines for most of the journeys I selected. Some of the other search methods are less effective though; the map can be tricky to use for choosing long haul flights, and the site would benefit from keeping prices more up to date. Thomas Cook redesign: Has it improved usability? It was announced recently that US shopping search engine TheFind.com will provide its search technology to PayPal Offers, which returns results exclusively from merchants that accept payments through the eBay-owned system. The innovative School of Everything offers a great chance to learn from others like you. But will its combination of user-generated and company-generated navigation help or hinder findability in the long run? Having already made some changes to its feedback policy and search, the online auction site has recently introduced a new ‘My eBay’ summary page for users in beta.